You should go online, put a library hold on this novel, and then–when it becomes available in two or three days–you should drop everything and read it. 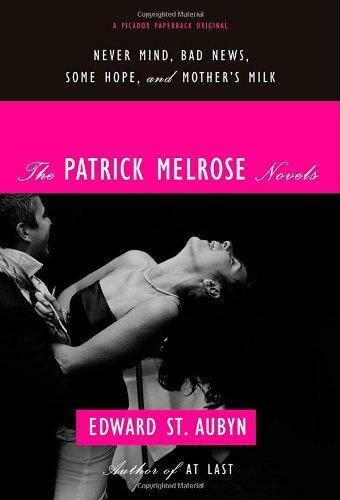 A few months ago, a professor of mine recommended Edward St. Aubyn’s Patrick Melrose novels. They’re about the life of a feckless English aristocrat in the 20th century. This seemed intrinsically fascinating to me. I love 19th century British literature, which is all about squires and aristocrats. Then, at some point, writing became a bourgeois occupation and all those people utterly dropped out of literature. And I thought it’d be nice to check in and see how they were doing. And, through the eyes of his dinner guests and his wife and his son and his maid and, at one point, a local gecko, you see him toy with everybody and just generally be a miserable git. Most of the people in this novel are terrible people. Even the five year old son is on the terrible side. But I didn’t care. There’s so much life to them! And the novel is so ambitious! It’s really thrilling to read a novel that does so much more than what it needs to do: a novel that throws more and more things into the mix until they start slopping out. For instance, one of the primary characters if the hippyish British girlfriend (also a minor member of the gentry) of one of the guests. She’s so different from everyone else in the novel! But she has a place there too. She’s part of the scene. Also, I loved her the best. This is one of those books that is actually, on a sentence level, very well-written. I mean, honestly, most times well-written is a euphemism for “nothing to complain about.” But in this book you really feel like you’re there. For instance, take this sentence where a character who’s just boarded an airplane describes how he feels. He felt another wave of tiredness from the processed air, the slight pressure on his ears and eyelids, the deserts of biscuit-coloured plastic around him and the dry acid taste of the champagne. I read that sentence and actually felt the air. I felt the pressure on my eyes. I wasn’t just reading words; I was actually in an airplane. That takes an enormously observant eye combined with a talent for putting words together. And that’s not something that most authors have. Go out, give it a shot. Many of you will hate it, but I think that large numbers will really enjoy it. (I also just read the second novel Bad News. It’s not terrible, but I’ve read it before. It’s basically about a grown-up Patrick–the five year old from the previous novel–going on a drug binge in New York. It’s not terrible, but I’ve read this sort of thing before. It’s very Naked Lunch. It’s very Portrait of the Addict as a Young Man. It’s very Confessions of an English Opium Eater. [Err, and also, reading about needles makes me squeamish] However, I’ve just begun the 3rd book, and that looks like a return to form.